Thank you for your support and participation in the Society of General Internal Medicine (SGIM) over the past year. 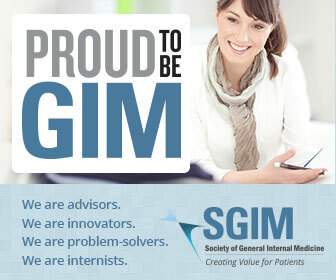 As a member of SGIM, you are part of the over 3,000 academic general internists and trainees who are all dedicated to SGIM’s mission of leading excellence, change, and innovation in clinical care, education, and research in general internal medicine. Continued membership in SGIM is the most valuable part of your networking portfolio. As a member of this diverse organization you are active in education, research, clinical care, management, and policy. Renewing your membership today will ensure that you continue to further the mission of SGIM and the careers and goals of GIM clinicians, educators, investigators, and trainees. Under "My Membership" click Join/Renew SGIM"
​Questions? Contact Muna Futur, Member Relations Manager at membership@sgim.org. Attend a Meeting: Registration for the 2019 Annual Meeting in Washington, D.C. is now open. Take advantage of the member discounts! Network and Collaborate: Connect with your colleagues and search the member directory. Login required. Find a Mentor or Mentee: Connect with another member to discuss both personal and professional growth in GIM. Volunteer: Shape the future of GIM while building your CV. Volunteer your time and expertise!